There’s a fine line between feeling satisfied after a meal and feeling stuffed. A lot of us fly past that line all the time and don’t see it until it’s far, far too late — slumped over, holding your stomach, undoing the top button of your jeans. The physical discomfort will thankfully pass, but overeating can also have long-term consequences, especially if you’re trying to lose weight. Wouldn’t it be great if we could just tell when we’re perfectly satisfied and then . . . stop? 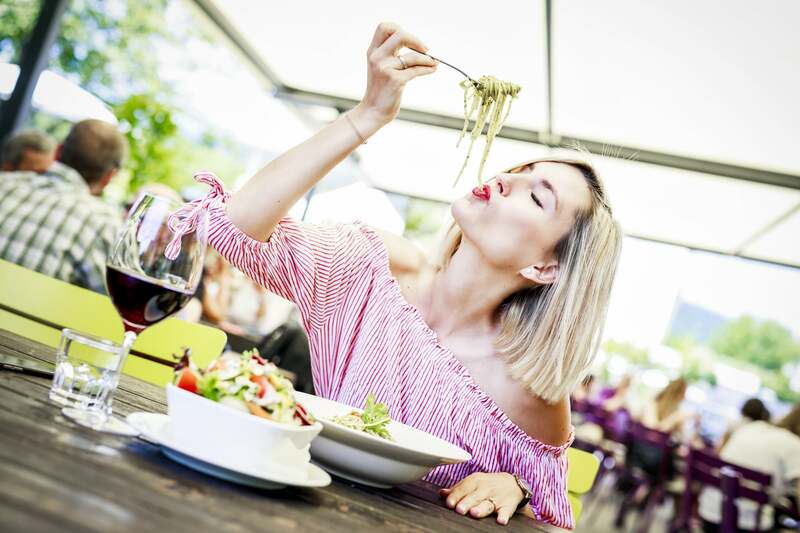 “Eat until you are no longer hungry, not until you are full,” is the way Kristin Kirkpatrick, a registered dietitian at the Cleveland Clinic’s Wellness Institute, puts it. But what’s the distinction there, and how do you make it happen? For many of us, the feelings of hunger don’t seem to stop until we’re as full as we can possibly be. For me, that means post-dinner snacks like cereal, applesauce, or carrots — something to nibble on to fill up that last little bit. This is fine if you’re still actively feeling hungry, Kristin said. But if you leave a meal still knowing you could pack a little more in, even though you feel satisfied, it might actually be time to stop. What you’re trying to avoid is that feeling of being uncomfortably full: heavy, bloated, tired, like there’s “a brick in your stomach,” Kristin said. You probably know what it feels like to be overfull or really hungry; now it’s a matter of distinguishing between the finer points in the scale until you hit your perfect, satisfied state. “Over time, it becomes easier to sense,” Kristin said. So at your next meal, try chewing more, slowing down your bites, and asking yourself how you’re actually feeling before moving on to the next thing. Still hungry? Go for it. Feeling sated? Great — take a break and set down the fork. Tuning into your body’s hunger cues will help you shed pounds and, even better, feel fueled instead of overfull.